Phonographic Copyright (p) – Flying Rhino Records Ltd. Copyright (c) – Flying Rhino Records Ltd.
Track 1 title given as "Frogs Dinner", corrected here. Great dub ambient compilation released when Dub, Trance was just starting to get noticed. This collection includes one of the best "Total Eclipse" tracks ever released, "The Blob". The Simon Posford influence in "Binah - Crescent Suns" is definitely the big grab here for any Shpongle fan. This is one of the best releases Flying Rhino ever came out with in my opinion. And that says a lot, because this label kept a high quality from beginning to end. 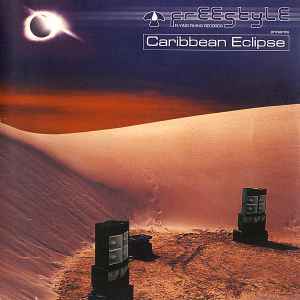 The theme on this compilation is the total solar eclipse that passed over Colombia, Venezuela and the Caribbean Sea on the 26th of February 1998. The perfect ambient/downbeat compilation including ten of the most talented musicians from around the world within this kind of chill music. Not a single bad track here in my opinion, but the stand out track is withouth doubt the Binah - Crescent Suns track. An almost 12 minutes beautiful journey, given us by two of the true masters in the scene, Simon Posford and George Barker. But the track wouldn't have been the same without the gorgious vocals by Jewel Stanbridge. Her voice in this track is absolutely stunning! This compilation is the perfect example of how strong a downbeat compilation could be. It has brought me a lot of good memories as well as great inspiration for my own label. Just get it!